THE UNEMPLOYED EATER: Good News! The Next LA Pizza Society Is Coming Up! Good News! The Next LA Pizza Society Is Coming Up! So, this is a quick little download that I have good news: next week I will have good news. RIGHT IN THIS VERY SPACE ON THE INTERNET. In that, I mean the announcement of the date, time, ticket info and location of our next LA Pizza Society convocation! So look out for it. Per ushe, it will be cheap and will include unlimited pizza at one of the city's top slingers. As for that beautiful supermodel above? I ate it over the holiday break. It came via my favorite Santa Barbara shop, Lucky Penny, which should be a must stop for any pizzanista in the area. 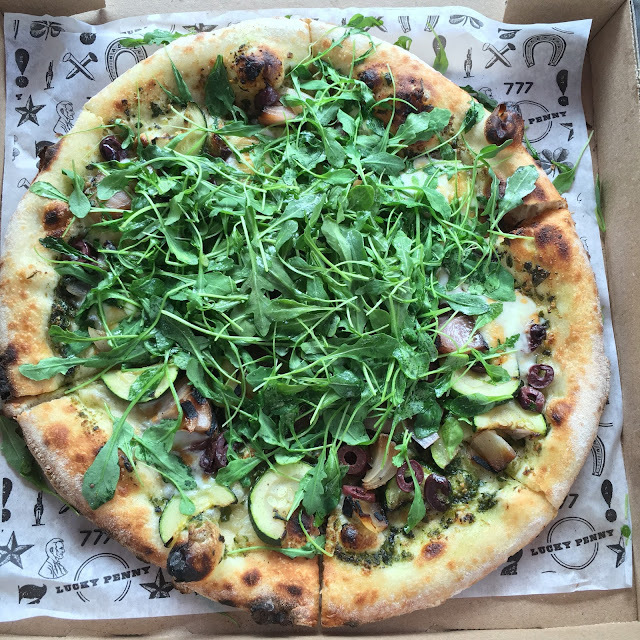 That's the Green + Black - pesto, zucchini, roasted onion, kalamata olives, taleggio and arugula - and it's fresh (both literally and street slangily).